Canadian architect Moshe Safdie designed and built this extraordinary experimental housing complex made up of modular concrete units for the 1967 World Expo in Montreal. Named Habitat 67, the apartment complex was Safdie’s attempt to redesign urban living, provide affordable housing and create a community complete with shops and a school. All of the units were prefabricated on-site, and each has its own rooftop garden space located on the roof of the neighbor below. Safdie was dissatisfied with suburbia and visualized a new type of urban dwelling that would house a lot of people and yet still provide them with privacy. 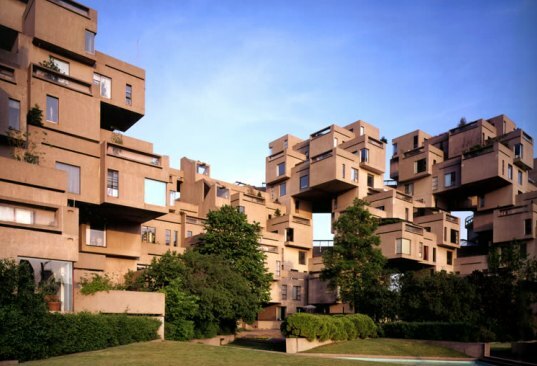 Originally Habitat 67 was planned to have 1000 housing units, which would be used during the Expo as temporary residences for visiting dignitaries. Unfortunately, it was downsized to 158 units without a school or shops. Construction began in 1966 and soon a mountain of 354 concrete blocks rose on the Marc-Drouin Quay on the Saint Lawrence River. 15 different types housing options were designed by Safdie to accommodate different sizes of families and create a diverse community. In order to make the complex affordable, Safdie devised a plan for on-site mass production of the concrete blocks. Safdie felt that prefab construction was much more efficient, so he created a factory on the peninsula to construct the housing units. There were four large molds to form the basic shape of each standardized unit. A reinforcing wire cage was dropped into the mold and concrete was then poured around it. After the unit cured it was removed from the mold and moved to the assembly line where a wooden sub-floor was installed with electrical and mechanical services below it. Windows and insulation came next, and then prefabricated bathrooms and kitchen modules were installed. Finally the unit was lifted by crane into position on the building. Unfortunately Habitat 67 was not as affordable as Safdie had hoped, costing $22,195,920, or about $140,000 per living unit. Also, at the time the complex was not completely embraced as its location was too far from the center of Montreal. Still, it’s a fascinating study in prefab architecture and Safdie’s model for industrialized manufacture of affordable housing offers a good lesson for anyone attempting a similar project. ElHábita de Montreal en 1967 es casi un buen ejemplo del dominio que los arquitectos deben tener de su oficio profesional como un todo. Moshe Safdie nos ofrece la oportunidad de aprender de su experiencia, una experienciencia fuera del espacio y el tiempo en que se vive. Ése, es el trabajo de un visionario de la arquitectura. Sin embargo, su dominio de la forma, la función, la estructura, y los sistemas constructivos hacen realidad el trabajo creativo del arquitecto; siempre y cuando se consideren los aspectos complementarios del mismo, la integración social, su pertinencia en el momento histórico de su construcción, sin olvidar que las condiciones económicas, suelen ser el "talón de Aquiles" de las obras arquitectónicas. Rafael Horta. Passez voir de nombreuses photos sur le site du courtier immobilier de l'Habitat 67. Des nouvelles photos et descriptions sont toujours ajoutées afin de montrer les propriétés à vendre ou à louer. Dans le haut de chaque page, des nouvelles photos sont mises à jour afin de refléter l'image d'Habitat 67 sur www.rslefebvre.com À voir...! Canadian architect Moshe Safdie designed and built this extraordinary experimental housing complex made up of modular concrete units for the 1967 World Expo in Montreal. 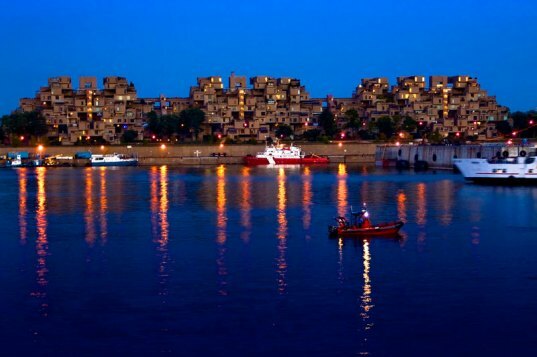 Named Habitat 67, the apartment complex was Safdie's attempt to redesign urban living, provide affordable housing and create a community complete with shops and a school. All of the units were prefabricated on-site, and each has its own rooftop garden space located on the roof of the neighbor below.